Kim Thuy. Photo by Benoit Levac. Kim Thuy is everywhere these days and not just to pick up literary awards from such luminaries as the Governor General and Princess Caroline of Monaco. One morning at La Sportheque in Hull, as I was doing my daily treadmill run, I happened to look up at the bank of television screens on the wall and, on one channel, spotted Thuy. The restaurateur-turned-author was a guest on the Radio-Canada cooking show, Les Chefs. I had never met Thuy at that point. But the cook preparing some exotic Vietnamese eggplant dish on national television looked exactly like the glamorous movie-star-style portrait Thuy’s book publisher, Random House, had just sent me. A few hours after Les Chefs, I met Canada’s skyrocketing literary sensation in person for an interview about her new – newly published in English, anyway – book, simply entitled Ru, a word that means “lullaby” in the author’s native Vietnamese but, in French, means a small stream, as well as a flow of tears, blood, or money. Kim Thuy in front of memorial at the Plant Recreation Centre. Photo by Paul Gessell. Thuy is definitely in demand. The interview was being conducted in the foyer of Plant Bath, at Somerset and Preston. The foyer looks directly into a large swimming pool where a group of men near us on the other side of the glass stood up to their waists in water. Bathing suits were not visible but presumably were being worn. We had met at this rather unusual interview venue so Thuy could be photographed outside at the nearby memorial to Vietnamese boat people; Thuy herself is one. 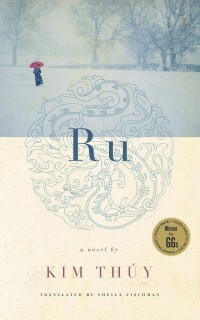 Ru is the story of a young Vietnamese girl, Tinh Nguyen, who, along with her family, is forced to flee Communist Vietnam, eventually settling in Quebec. It is an enchanting book, told in brief fragments that seem to be as much poetry as prose. 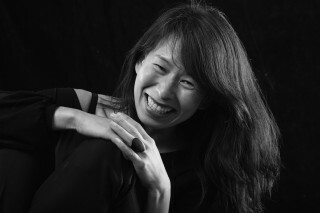 Ru was inspired by Thuy’s own life – she came to Quebec at age 10 from Vietnam – but it seems impossible to get a straight answer from author, who is as hyperactive as a two-year-old, as to just how similar her life was to that of her literary heroine. (Perhaps Thuy was too distracted by the swimmers to answer those questions). The book was originally written as one long paragraph. Thuy’s French-language publisher, Editions Libre Expression had to convince Thuy to break up the story into paragraphs and chapters. As you may have guessed, Ru was Thuy’s first book. She did not start writing with a view to producing a book. She just loved playing with words, writing being an activity she compares to crocheting. She never even sought a publisher. A customer of the Montreal restaurant she formerly owned heard that she loved writing. He begged her to give him a few pages and then passed them along to a publisher friend. The result was Ru and a 2009 Governor General’s Literary Award for French Fiction. Other French-language literary awards in Europe followed. One nomination was for the literary prize called the Prix Prince Pierre de Monaco. That was how Thuy met Princess Caroline and, while in Monaco, also befriended Pascal Janovjak, a Swiss writer based in the Palestinian city of Ramallah. Thuy and Janovjak began on a correspondence, which was packaged as a book called A Toi and published last fall. Thuy is already at work on a third book. So, how long will Thuy’s writing career last? She confesses that she has a tendency to change careers every five years. This mother of two has already had careers as a lawyer and a restaurateur. She still has a few more years to go before reaching the five-year mark as a writer. Who knows where Thuy will next appear?